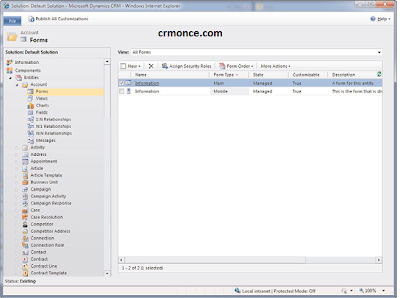 Basic customizations are customizations to Microsoft Dynamics CRM that don’t require any knowledge of programming or database design and configuration. 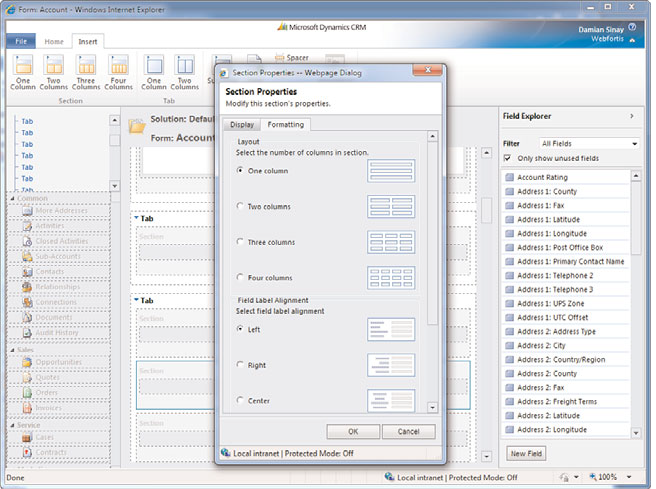 Basic customizations include showing and hiding controls on a form, and hiding or showing columns in a view. 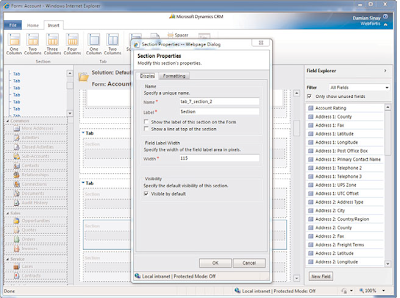 New and welcome features of CRM 2011 are that an entity now supports more than one form, and the default main and mobile forms can’t be deleted. With this new version, you can create other forms with fewer or more fields displayed and assign them to specific CRM roles. This means that you can create another form if you want to show different fields for different users or roles. 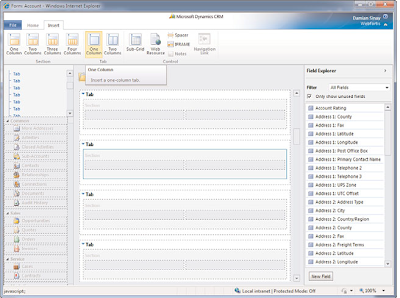 The tabs in CRM 2011 behave different than the previous versions even though they are still called tabs, the tabs names are now displayed on the side navigation bar as links pointed to bookmarks in the form as all the tabs and fields controls are contained in the same form than can be also accessed using the scrollbar. This version enables you to add as many tabs as you want; there is no more limitation of a maximum of eight tabs as it used to have in CRM 4. Figure 23.8 shows a for with lot of new tabs with the label Tab, added to the form after you click the One Column button that is on the Insert tab of the Ribbon in the Tab group. Each tab is also added to the tree node on the sidebar of the form. FIGURE 23.8 New custom tabs added called Tab. As opposed to previous versions, now every time you add a new tab it will also add a new section inside the new tab. 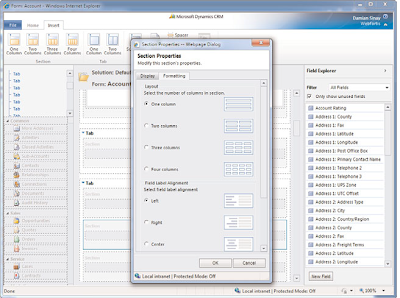 Sections are used to group controls of related fields. The sections must be within a tab. To add a new section, click the buttons that are in the Insert tab under the Section group.When you double-click the new added section, you will be able to see the section properties (see Figure 23.9). You can choose whether you want to have a label displaying the section name, and you can also specify the width of the field area, as shown in Figure 23.9.You also have some limited layout options, as shown in Figure 23.10. FIGURE 23.9 Adding a new section to the tab. FIGURE 23.10 Selecting the layout.